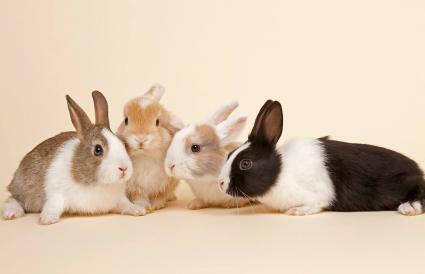 Rabbits are adorable pets that are generally easy to care for. If you don't have a lot of space and prefer to get a bunny on the petite side, there are many cute options to choose from! A dwarf rabbit is one that has a dwarf gene which produces specific physical attributes including big eyes, short ears, a big round-shaped head and a small body. Dwarf rabbits carry the dwarf gene from one parent. 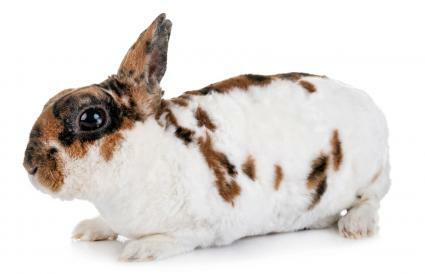 A dwarf bunny that gets the gene from both parents will either be born stillborn or die shortly after birth. These unfortunate rabbits are called "peanuts." 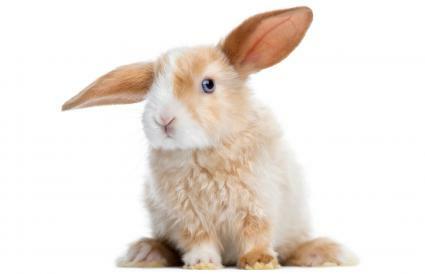 Sometimes a dwarf rabbit breeding will produce a "false dwarf" which occurs when the rabbit does not receive the dwarf gene from either parent. These rabbits will look physically a bit like a cross between a dwarf and a "regular" small rabbit. In short, all dwarfs and minis are small rabbits, but not all small rabbits are dwarves or minis. The American Fuzzy Lop weighs no more than 3 to 4 pounds as an adult. They are sometimes referred to as "bulldogs" because they have a flat face. They require a lot of grooming because of their wool fur and have special dietary needs. The breed is known for having a pleasant personality and are very social with people. American Fuzzy Lops are also very playful and are a good choice if you want a rabbit that likes toys. They are more susceptible to wool block due to their wooly fur and also to getting matted fur if not properly groomed. 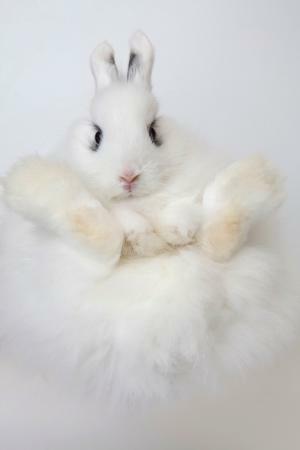 The Dwarf Hotot will weigh about 2 to 3 pounds when fully grown. They come in white with a black ring around their eyes which makes them look like little goth rabbits. Dwarf Hotots are a great choice for a pet as they enjoy being with people and have a reputation for bonding strongly with their humans. They also tend to enjoy handling more than many other breeds. 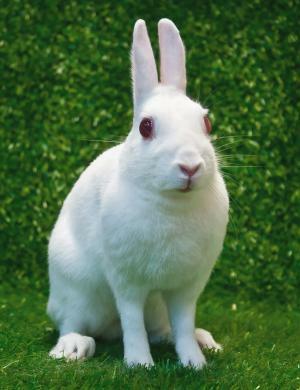 They're also very active so they're a good choice for a family looking for a bunny that might enjoy activities like rabbit agility or clicker training. Despite their activity level, they don't need a big cage so they're a good choice for smaller living spaces. Compared to other breeds they have a higher risk of developing malocclusion. Holland Lops range between 2-3/4 to 4 pounds maximum. 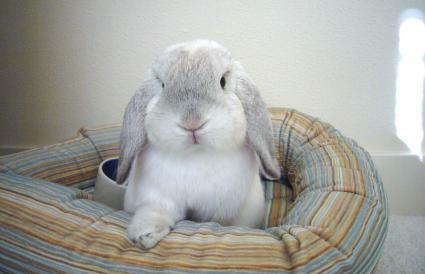 The Holland Lop is the smallest rabbit breed with lop ears. Holland Lops come in most colors and patterns. They are known for having terrific personalities and are a very popular choice for a pet. They are known for not enjoying too much handling, so they are a better choice for families with older children. They do tend to chew more than some other breeds, so they'll need lots of enrichment items to keep them happy. They also tend to need more exercise and room to move about than other small breeds. This fluffy breed weighs 2-3/4 to 3-1/2 pounds as adults. They have very thick, long fur on their bodies and will need a lot of grooming as well as a specific diet to keep their coat healthy. They come in most colors and patterns. Despite their grooming needs, they are not difficult to care for and can make a great calm pet with a very distinctive look. They are known for being good with children and have a reputation for never, or rarely, biting. They don't need a great deal of room or extra exercise. They do have a risk of wool block if they're not groomed properly. Lionhead rabbits are 3 to 3-3/4 pounds at the most. They have thick, medium-length fur and get their name from the "mane" formed by the fur around their head. The rest of the fur on their body is shorter and not as dense as the mane. They come in many colors although only two are recognized as a breed standard which are REW (red eye white) and tortoiseshell. They do require some extra grooming to care for their mane and they will molt their coats a few times a year. They are at a higher risk of malocclusion, hairballs, and digestive and respiratory health conditions. Lionheads have a reputation for being very affectionate, love playing and handling, and are a popular pet choice. The Mini Rex is about 2-3/4 to 4-1/2 pounds as adults. The breed gets its name from its "rex" coat which has a velvety feel to it. They are a popular pet choice because of their incredibly soft and plush fur that comes in many colors. They also have docile, friendly temperaments and make pleasant companions. They may not be a good choice for very small children as they don't enjoy being held tightly and do better with children old enough to respect their space. The Mini Satin weights 3 to 4-1/2 pounds fully grown. The breed is a miniature version of the Satin rabbit and has the same beautiful satiny shimmer to their fur. They come in chinchilla, opal, red, Siamese and white colors and patterns. Mini Satins are a popular pet rabbit choice for families and have a docile personality, but they can be shy around new people. Some Mini Satins can be nervous around children so they may not be a good choice for a home with small, boisterous children. They have smaller space needs so are a good choice for smaller living conditions and they don't need a lot of exercise. One of the smaller rabbits on this list, the Netherland Dwarf reaches sizes of 1-3/4 to 2-1/2 pounds. They are one of the smallest rabbit breeds. 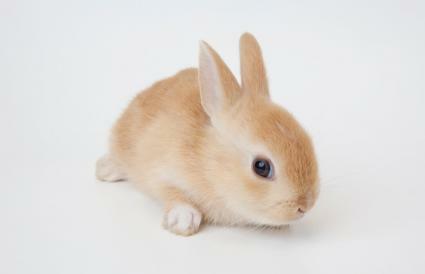 Netherland Dwarf rabbits may not be the best pet for smaller children as they can be nippy and skittish. They tend to enjoy quieter environments and have a reputation as a good choice for adults only homes. They also are at more risk than other breeds of malocclusion. Despite their tiny size, they need lots of room and regular exercise. This breed is one of the smallest and weighs about 2 to 2-1/2 pounds when fully grown. They come in agouti, black, chestnut, otter, sable marten and white. They may not be the best breed for small children as they can be more active and will nip. They have a very delicate frame and are best handled by experienced rabbit owners. This breed is also called the Polish rabbit in the United Kingdom. An adult Himalayan rabbit will weigh 2-1/2 to 4-1/2 pounds maximum. They have similar coloring to a Himalayan cat, with a white body and black, blue, chocolate or lilac "points" on their ears, nose, tail and feet. They are actually one of the oldest rabbit breeds in the world. 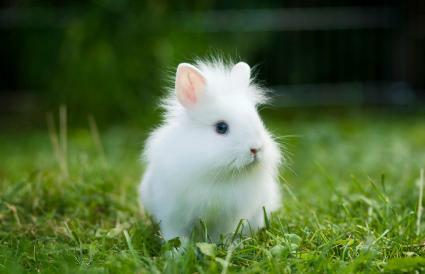 Unlike some other small rabbit breeds, Himalayans have a longer body and a much less compact build. Himalayans are a popular breed for both pets and for showing and are generally laid-back rabbits who love cuddling. 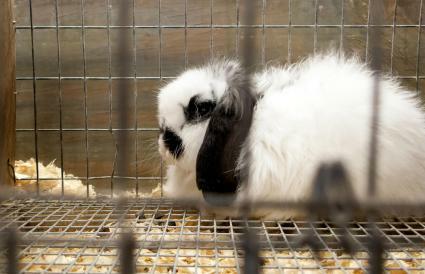 They are considered "one of the best rabbits for young children" by the American Himalayan Rabbit Association. 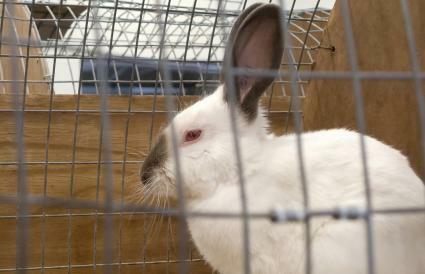 Dutch rabbits are one of the larger choices among the smaller breeds, coming in at 3-1/2 to 5-1/2 pounds maximum. 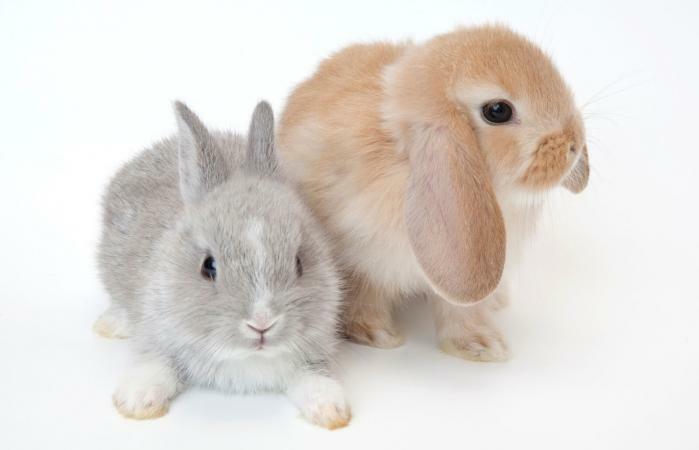 These are a very common and popular pet rabbit breed. They come in a mix of white and black, blue, chocolate, gray, steel or tortoise, with the white covering their midsection, the blaze of the face and their feet and toes. This is a breed with an excellent history as a pet for children because of their wonderful outgoing temperaments. They require more room than some breeds and will need regular exercise. 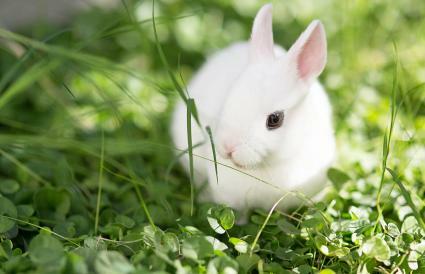 If you're looking for a small rabbit because you don't have a lot of space, make sure you read up on each of the smaller breeds and their care requirements. Some small rabbits need a lot of room for exercise despite their tiny size. Others may seem like a good choice for small children because they are petite but their temperaments can be skittish and they can bite if handled too much. Make sure if you're looking for a family pet to choose one of the excellent small rabbit choices known for loving attention from both children and adults.